Phone cameras are powerful, but they have their limitations. This smartphone lens set gives you more chances to take stunning photos. The two tiny-but-robust lenses can be attached to 60 types of devices in seconds—tablets included. The first is a 2-in-1 lens offering both a wide angle and macro lens, while the second is a fisheye lens. Expand your shot with a subtle 0.67x wide-angle lens, letting you fit more in your frame while maintaining the integrity of your photos. This is a lens perfect for creating portraits with just the right amount of breathing room. Zoom in ten times as close with the macro lens and get the fine details you couldn’t with your phone alone—the subtle hues of an eye, tiny insects, or the delicate bristles on a flower stem. You can also amplify your view up to 190-degrees with the fish eye lens. Capture the majesty of landscapes and larger scenes. Maker Tyler Bodmann grew up surrounded by picturesque scenery in Cape Town, South Africa. This prompted him to create DSLR-quality lenses that could be attached to almost any phone. The set comes in a durable case you can carry in a pocket. Or keep a lens fixed on your phone so you never miss the perfect photo opp. Hey there guys and girls! Thanks so much for taking the time to see our product. I'd like to introduce you to our labour of love: Limelens Smartphone Lenses. I'll be here to answer any questions you may have, chat soon! Here is a list of all phones Limelens is compatible with. And here is a list of all cases Limelens is compatible with. @Mike Thank you for adding in the Compatibility List! We are also now compatible with the iPhone 7 and the iPad Pro 9.7" :) testing was done this morning in Cape Town and the results were great with both! @Bonnie unfortunately we are not compatible with the iPhone 7+. We are currently working on a new fully universal attachment, which we will release sometime next year though. Please let me know if you have a case on your iPhone 7+ and if so, which case, as this may change things. @Tyler I have an iPhone 7 Plus with an Otterbox Defender series case. @Richard I'm sorry I missed this message. No, unfortunately your case is much too thick for any smartphone lens to work with. I do understand as integrity of the phone is so important, especially a brand new iPhone 7 Plus! I've tried something like this in the past - I think the lenses were fine, but acceptable repeatability in terms of getting the lens exactly aligned to the camera lens was lacking. Does your product take care of that issue? Also, what issues should we consider with phone cases? Does it work with a typical phone case, or must the phone be bare? @Michael that's a great question and on a similar thought pattern to what probed us into creating Limelens. The Limeclip (attachment) is attached with an alignment tool the first time and then adheres permanently to either your smartphone or phone case, meaning that your lens will be correctly lined up every time you twist it in. With regards to phone cases, as long as they aren't thick and bulky, you can attach the Limelens to the back of the case as welll. The incompatibility with thick cases such as the Otter Box is that the lens should be as close to the smartphone camera as possible in order to maintain clarity. We have also found that rubber cases or other flexible cases allow for you to adhere the Limeclip to the smartphone itself and to then fit the phone case over the Limeclip! Are the lenses compatible with the exovault cases for iPhones? @Seth What iPhone do you have in particular? I'm super excited about these! My question is whether I can purchase a second Limeclip separately. That way, both my husband's phone and mine are able to use the lenses. Otherwise, inevitably the person without the clip will suddenly have need to take the photo, LOL! Thanks! @Melanie hahaha that's an awesome question! Yes, this is something that we can most definitely arrange. What phones do you and your husband have? I ask because each set comes with 3 Limeclips which fit different smartphones and make up the large compatibility range. I will chat with the Grommet and see how we can make this happen. But we will make this happen haha. @Tyler we both have the iPhone 6s. Thanks for looking into this! I'm curious... in a year or so when we upgrade our phones, will you be continuing to come out with clips to fit whatever new models Apple or Samsung develop? Just curious if these lenses will become 'obsolete' in the near future because of new phones. @Melanie while we cannot predict the phone models that will be released in the near future, we are here to stay and will be continuing to make clips for the widest range of smartphones on the market. We are however working on a truly universal attachment that we hope to release towards the end of next year. Our plan is to continue with the current attachment method and add further products to our arsenal, rather than replacing old attachment methods with new attachment methods completely. Another thing to note though is that smartphone cameras are expected to change their optics as time goes on. The iPhones of the future may very well increase their field of view (how much the camera can capture) beyond the capability of our current lenses and in that case we would need to have created newer lenses to adjust for this. I am waiting to hear back from our US team regarding these extra Limeclips. Will post here as soon as I have an answer for you! @Melanie we will be adding an extra set of limeclips to your Limelens Set free of charge!! My apologies for the wait! Thank you for the support! @Tyler wow. Above and beyond! Will Grommet just recognize my name on the order? Placing it now! very excited. Tyler, I have a LG Rebel LTE Tracfone, would Limelens work with this phone? Hi Anna, check out the list of compatible phones at the top of the comment board. @Mike my apologies, the LG Rebel LTE Tracfone is not on our list as it was not made available in South Africa. After looking it up now, I absolutely believe we are compatible with this Smartphone. We will update our compatibility list to include this too. Will these lenses work with Android 4G devices? @Denise do you have a specific model in mind? Hi Tyler, What a great way to take better pictures than ever before! Great work! I was wondering will this world on an Amazon Kindle Tablet? @Katy this is not something we had even considered. Our lenses would absolutely work with the Amazon Kindle Tablet! We shall add it to our compatibility list :) Thanks for the great question! What types of phones will this work with? Hi Nanette, a complete list of compatible phones can be found at the top of the comment board. @Mike Thanks so much Mike. I do have a case, but it's just a knock off. I'll go back to my records and check what it is exactly and get back to you. I do agree this phone's camera is amazing, but I would certainly love the ability to take the close ups that your limelens allows! @Dale rather than going through the mission of finding what exact case you have, maybe take a picture of the case and send it through to [email protected] I'll check it out and let you know asap! I was checking the compatibility list. Of course, my Samsung Galaxy S6 is not listed. Why would you go from the S5 to the S7? Curious, as I was ready to purchase. @Dale this is something we are asked a lot, not surprisingly as the Samsung S6 has such an impressive camera. The S6 came out with a camera that was unprecedented in terms of how far it protrudes from the phone, so much in fact that the S7 camera went back to being quite flush in comparison. 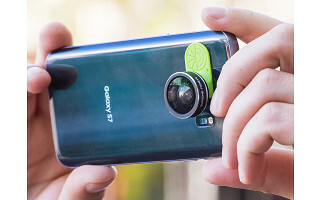 We do not list the S6 as the Limeclip does not fit snugly without the use of a smartphone case. If you do however have a smartphone case then this is a different story and you could attach the Limeclip to the back of the phone case instead. Please let me know if you do have a smartphone case and if so, which type, so that I can personally check the compatibility for you. @Tyler I guess you'll get no end of compatibility questions so here's another...my new Google Pixel XL? @Bill I can't tell you how jealous I am of you. That's probably the best Smartphone Camera on the market. We have not yet been able to test our Limeclips with the Google Pixel XL, however from the pictures, it certainly seems like there is plenty of space for attachment. I will 100% take the fall if by some travesty, we aren't compatible with your phone. Hi Tyler. Can this lens be used with an iphone 6s that's in a slim otter box? Hi Liz, you can check your phone's and case's compatibility at the top of the comment board. @Liz, unfortunately even the slim otter box case is far too thick to allow for our lenses to get close enough to the camera for the clarity your iPhone 6s deserves. I have iPhone 5s. Wit an otter box case. Will I be able to use the lens with the case on? Hi Nadine, you can check with the phone and case compatibility lists at the top of the comment board. @Nadine, unfortunately we do not work with the Otter Box cases. My apologies! @Tyler I too have the 5s with an otterbox case so am a little sad this wonderful technology won't work for me. @Theresa I am more sad than you are :( unfortunately, no smartphone lenses on the market can deal with the thickness of the Otterbox cases... Perhaps one day we shall meet again! I notice the Samsung Galaxy Note 4 is listed, but not the 3. Aren't they exactly the same body/ size? @HeathCliff the main body is the same, however the camera protrudes in such a way that it is not possible for our Limeclip attachment to surround the camera. If you have a smartphone case then this may be a different story. Let me know if you do and I will check the case online to see whether we could work. For protection of my iPhone 6 as well as for convenience, I use an Incipio stash back case. Is the mount for the lenses compatible with this case, or, like the Otterbox cases, is it too thick? Thanks! @LINDY yes I'm sorry to say that the Incipio Case makes it impossible for our lenses to get anywhere near your smartphone camera. Due to the irregular shape of the Incipio Case, our mount would also not be compatible. Thank you for your question! I have a Motorola Droid Turbo 2. Will you be making this available for Motorola Droids? The camera is centered on the phone, with the flash below it. @Judi we do not fit the Motorola Droid Turbo 2. Unfortunately this is the situation with the majority of Motorola's since the middle camera/flash/button platform is slightly raised and does not sit flush on the back of the smartphone. I do not use a case but am concerned about mounting to the back of the phone as it has a textured back to and is slightly curved where the mount would go. Please confirm if it will mount adequately to this phone before i buy. @Bob thanks for your question. Although the phone does have a slight curve and textured back, as long as the Limeclip is positioned vertically beneath the camera, we will be compatible. I shall add this to our compatibility list! I have checked your list of compatible phones but still want to ask if this lens is compatible with the iPhone 5c or the Nexus 5. Look forward to your answer! A friend tried to attach a lens enhancing product to my phone. Had to take off my case and even then it did not attach well. Your product is more expensive, but will it easily attach...and I don't mind taking off the case if so. @Nora I do understand this frustration. Could you provide me with more detail as to what phone and case you currently use? Since you say the limeclip attaches permanently to the smartphone, would I be able to get another clip, separately, to use with the lens when I upgrade my phone? @Terri We do offer separate limeclips. If you do ever need extra limeclips please email: [email protected] and we will gladly help you out. If this was asked, I apologize for the repeat. I am doing this during a meeting, so I can't go back and read the entire page. How does your lens work with the category 2 camera cases? Is the lens positioned right next to the camera lens? If the clip is attached to the case, raising it off of the camera, how does it hold the lens in place correctly? @Gregg I hope the meeting is going well! I don't understand what you mean by category 2 camera cases? The Limeclip adheres to the back of the smartphone case so as long as the case isn't too thick, the camera will still be in close enough proximity to the lens to allow for a clear picture. The Limeclip is placed correctly the first time using an alignment disk and then sticks to the smartphone or smartphone case permanently. The Limelens would then be rotated into the Limeclip and is held due to increasing pressure from a camber on the inlaid groove of the Limeclip. Sorry for the essay! @Tyler At the top of this page is a link to a document listing compatible cases. They are organized as category 1 (clip attached to phone) and category 2 (clip attaches to the case). I've also seen it described that the lens is best placed right against the camera lens. Since category 2 phone cases attach the clip to the case, does this mean that the lens will NOT sit right against the camera lens, and instead hover over the camera lens by the thickness of the case? Or is the clip designed such that the lens can rest against the camera lens and the clip grabs the lens at that point and holds it in place. If the lens hovers away from the camera lens, what impact does that have to the quality of the picture? I saw the previous comments about the Galaxy s6. Do you happen to know what cases are already compatible with it? I'm trying to prepare this as a gift. @Danielle this is a tough question as there is a limitless range of cases on the market. However, if you have an idea of what the case looks like I could try help you? Do you know the name of the case by any chance? There is a high chance of compatibility as long as there isn't a large gap around the camera on the smartphone case, since the Limeclip needs to be "surrounding" the S6 camera for correct alignment. I have a Clamcase for my iPad mini 3. Will your device work with it? @Susan Yes we work with the Clamcase! Hi, how about compatibility with BlackBerry Passport and BlackBerry Priv? We still exist, and these are cool smartphones with physical keyboards! @Elina Do you use a case with either of these devices? @Tyler Hi Tyler, thanks for your response. I don't have cases for either. Can you tell me if this device will fit a 6SE? @Linda Yes we do fit that :) It is listed on our compatibility list under iPhone SE. It'll depend, Beverly. Check out the compatibility list at the top of the comment board to know for sure. Hi Tyler, and welcome! What a great product! I love photography but don't always want to lug around a DSLR - great way to get a better angle for quick phone pictures! I don't see my case listed on the compatible list so here's my question: What is the case thickness (measurement) range that the Limelens is compatible with? I currently have a Caseology case on my iPhone 6s. Thank you! @Sarah thank you for the warm welcome! I share your sentiments exactly, phones are most certainly the future of spontaneous photography... The case thickness is limited to about 1.5mm. Which Caseology case do you have exactly, I have had a look at their website and see that there is quite a large range, with many of the cases having a beveled/raised edge near the camera, creating an issue for our Limeclip to sit flush on the back of the case. Thanks for the great question! Hi! Great concept. I love(d) dslrs, but it just doesn't meet my ever-growing need for compactness and speed. I always have my phone on me. Apple continues to improved the quality of their camera and there are powerful apps that allow me to create beautiful pictures to get them on social media quickly. But it's true, there are limitations. I'm excited about the potential of a lens attachment for my iphone for even better quality. With that said... I currently have an iphone 6 and use a Rokform case (it's the only brand I will ever use). Will your lens attachment work for me? I will upgrade to a 7 soon. Will you ever have this available for our Droids? Phone cameras are powerful, but they have their limitations. 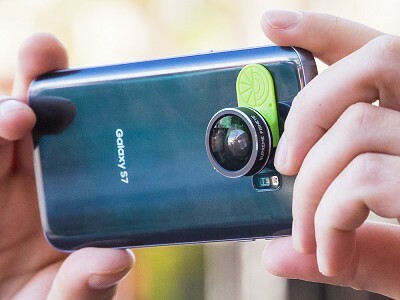 This smartphone lens set gives you more chances to take stunning photos. The two tiny-but-robust lenses can be attached to 60 types of devices in seconds—tablets included. The first is a 2-in-1 lens offering both a wide angle and macro lens, while the second is a fisheye lens. Expand your shot with a subtle 0.67x wide-angle lens, letting you fit more in your frame while maintaining the integrity of your photos. This is a lens perfect for creating portraits with just the right amount of breathing room. Zoom in ten times as close with the macro lens and get the fine details you couldn’t with your phone alone—the subtle hues of an eye, tiny insects, or the delicate bristles on a flower stem. You can also amplify your view up to 190-degrees with the fish eye lens. Capture the majesty of landscapes and larger scenes. Maker Tyler Bodmann grew up surrounded by picturesque scenery in Cape Town, South Africa. This prompted him to create DSLR-quality lenses that could be attached to almost any phone.